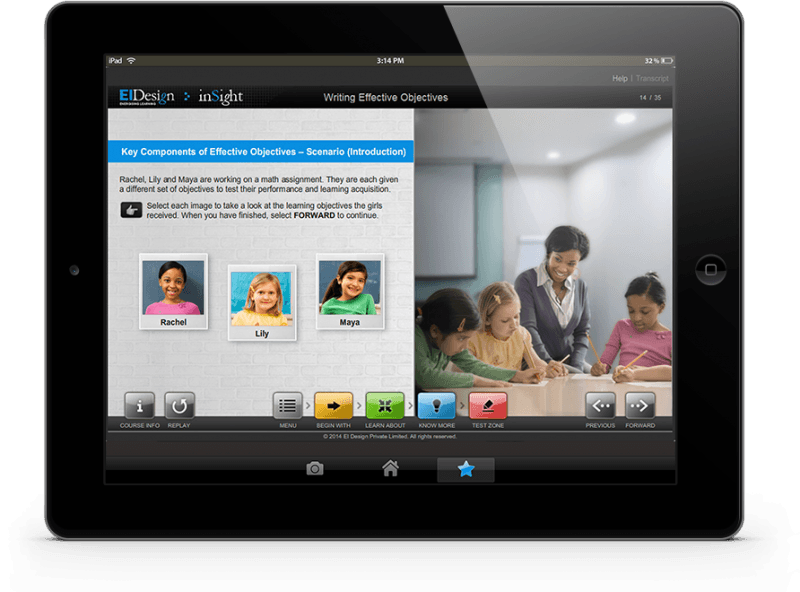 In this article I will outline how custom mobile learning solutions can be used for primary learning (formal training) and informal learning (performance support intervention and social learning) to provide the required performance gain you seek. Most of us are familiar with the “Forgetting Curve” that defines the exponential nature of forgetting. 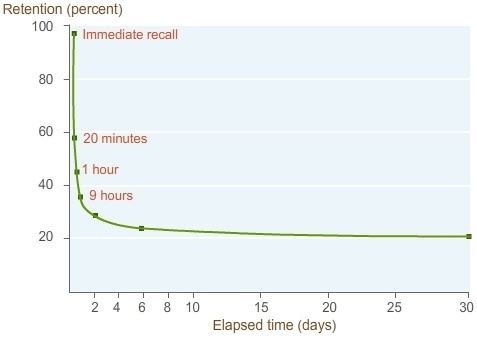 As you see from this diagram featuring the “Forgetting Curve”, we forget 80% of what we learned in 30 days! It is evident from here that it is not enough to have formal training that happens for a short period of time during the year and is expected to lead the learner from learning to application at work and a behavioral change. Instead, the adopted learning strategy must look beyond formal training and identify approaches to create “learning as a continuum”. How To Offset The “Forgetting Curve”? Is There A “Recall And Retention” Approach To Offset This? There are multiple approaches that can be used to offset the “Forgetting Curve”. 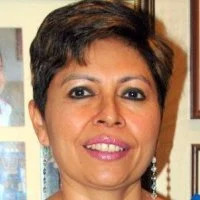 One of them is to have on-going smaller bytes of learning instead of one large chunk. If these bytes could be delivered in interesting and engaging formats and made available to learners within their work-flow, they will work effectively in helping learn, recall, and retain. Over a period of time, this would lead to the required application at work and the anticipated behavioral change. What Benefits Do Mobile Learning Solutions Provide? As we know, instead of one big training program, if there are smaller chunks of learning over a period of time we are likely to retain better. While this can certainly be achieved with traditional eLearning approaches as well, mobile learning solutions have a significant edge in achieving this. Flexibility and choice of device to access learning “anytime, anywhere”. Flexibility of learning with more varied formats (videos, podcasts, and so on). Better completion rates and higher retention. The bite-sized or micro-learning approach makes it easier for learners to initiate, complete, and retain learning better. Collaborative learning is a great way to engage with peers to share learning experiences and be part of communities of specific practices. The experiences are more immersive and statistics reveal that more learners complete the courses through mLearning than traditional eLearning. With multi-device support the same course is available on varied devices ranging from PCs, laptops, tablets, and smartphones. Mobile learning or mLearning is becoming the preferred approach to provide performance support intervention as mobile devices are an intrinsic part of the learners’ work-flow. Performance support facilitates an easy access to information while at work and increases the probability of usage and retrieval. Mobile devices can also be used to update learners on their “learning path” thereby facilitating “learning as a continuum”. With more people depending on phone-based organizers, integrating links in organizers to commence/resume the courses saves time for learners. 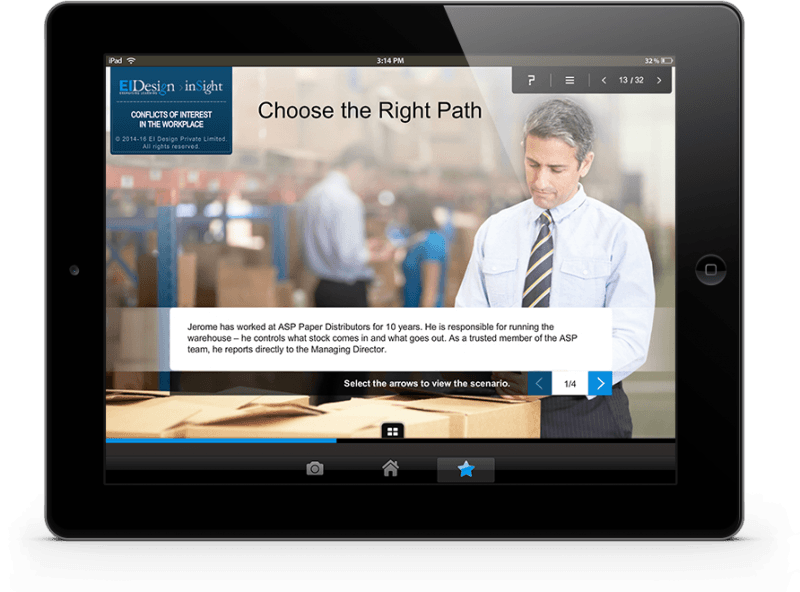 Can You Leverage On The Power Of Custom Mobile Learning Solutions For Your Company To Enhance Your Learning Strategy? My personal experience in working with several organizations globally is that learners very quickly opt for tablets or smartphones for learning. (As highlighted earlier, studies show that more learners complete the courses when they have an option for Tablets or Smartphones). How do we ensure that we leverage on this higher learner engagement for a more effective learning? This is where custom mobile learning solutions find the right fit. When learning for the first time. When wanting to learn more. You can use this framework to extend the formal training (for learning needs 1 and 2) and just-in-time Performance Support Tools (for learning needs 3-5). More specifically, looking at the nature of the learning need, you can integrate social learning programs. What Are The Significant Gains For Organizations If They Opt For Custom Mobile Learning Solutions? Custom mobile learning courses that are available on tablets and smartphones (similarly, you can offer mobile apps for primary learning). That is Performance Support Tools in varied forms like mobile apps, interactive PDFs/eBooks, expert videos, webinars/recorded webinars, whiteboard animations, and webcast/podcasts. That is social learning for collaborative learning, sharing, content curation, and so on. You can use creative Instructional Design to meet the learner-centricity objective with innovative learning designs delivered on tablets and smartphones (while retaining the flexibility of offering them on PCs and laptops). 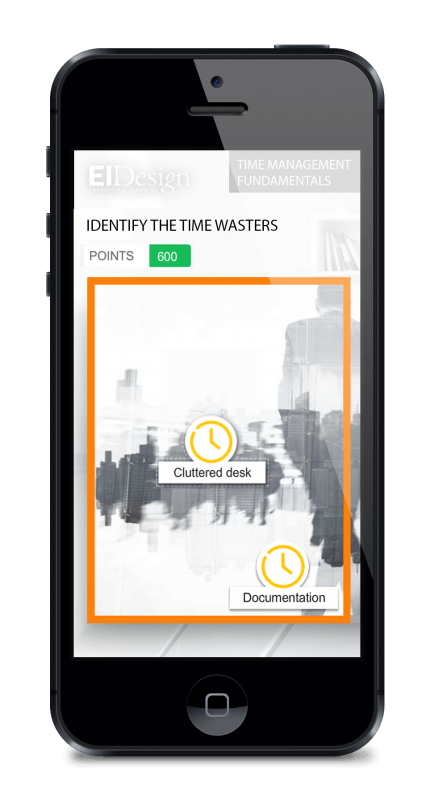 A gamified interaction to identify time-wasters that would in-turn help team members with effective planning was designed to deploy on smart phones. An interactive exercise demonstrating a conflict scenario at workplace where the learners could relate him/herself in the situation and make decisions. This mobile-friendly engaging interaction was designed to ensure sticky learning. An instance of story-based approach from our multi-device compatible Instructional Design courses. 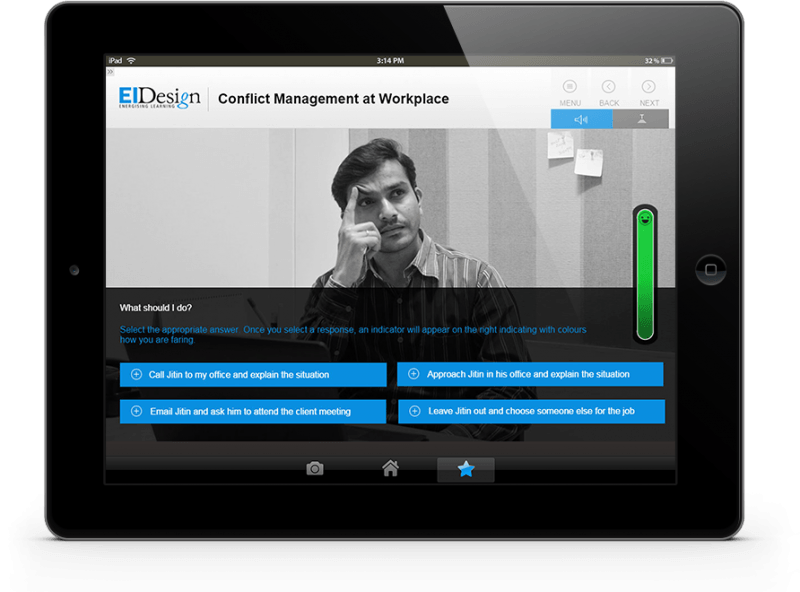 Learners get a chance to walk through and interact with a series of scenarios in this multi-device course to identify and mitigate conflict situations at work place. An exploratory navigation through instances where learners can choose among a set of options and evaluate what is right and wrong. Engaging videos designed for mobile devices that carry the learners through real life situations. The videos are paused at points letting the learners interact and check their understanding. Over the last 4+ years, we have crafted custom mobile learning solutions of over 400 hours for both formal and informal learning (Performance Support Tools). We have crafted learning strategies that work for both individual learners as well as for collaborative (social) learning. If you have any questions on how you can successfully integrate custom mobile learning solutions for your company, do reach out to me.